Rubber Hogue style grips, Full Size Cylinder with "Bullet" pellet carriers so you get the feel of loading a firearm! Fully adjustable sights, Speed Loader and even an accessory rail on the 4" barrel model. I know what you’re thinking: 'Did he fire six shots or only five?' Well, to tell you the truth, in all this excitement, I’ve kind of lost track myself. But being this is a .357* Magnum, the most powerful handgun in the world, and would blow your head clean off, you’ve got to ask yourself one question: 'Do I feel lucky?' Well, do you, punk? SIG Sauer P320 30 Round CO2 Pistol! Yes it is finally here, a semi-auto pistol with plenty of rounds to send down range. Great for shooting cans, dueling trees, and any other competition you can dream up. How about some IDPA practice? Built with a sturdy metal slide against a polymer frame, this Sig's claim to fame is its 30 round capacity. The first pistol of its kind, this belt-fed semi-auto is capable of firing both .177 pellets and BBs as fast as you can pull the trigger! Featuring realistic blowback, and fueled by a 12 gram CO2 cartridge held in the grip, you can propel your ammo choice at up to 450fps (depending on ammo weight/composition). With this many shots this pistol is great for hours of plinking fun! Recently selected by the US Army to replace the Beretta M9, this pistol is destined to see action overseas for years to come as the standard Army issue sidearm. This replica Sig has the exact same trigger pull as the real gun for a real feel, ideal for owners or fans of the real pistol, but less costly to shoot. Shooters can mount a flashlight or laser sight to the Weaver accessory rail and keep their target in sight. If you like attention to detail with more shots with less reloads, this is the air pistol you've been waiting for! Licensed replica of one of the most commonly used guns in military, police, and special forces. 8 shot magazine. Nickle & Wood Design. when the most accuracy counts, we have accessories to add a reflex sight or scope to these. 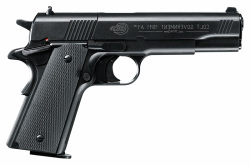 Licensed replica of one of the most commonly used guns in military, police, and special forces. 8 shot magazine. Nickel Design. 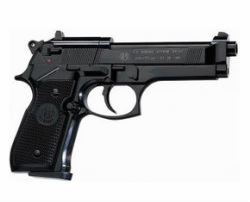 Licensed replica of one of the most commonly used guns in military, police, and special forces. 8 shot magazine. Black Design. The Smith and Wesson CO2 pellet revolvers are complete duplicates of the legendary Smith and Wesson 357 in both weight and handling. With a 10-shot magazine that swings out for easy and realistic loading and replacement. 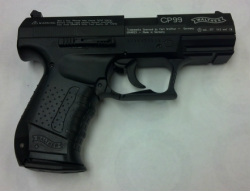 This is one of the most smooth, accurate, and powerful CO2 pistols available. Comes in a foam-lined plastic gun case. The little brother to the NightHawk. Bare bones without all the frills. LOOK FOR the Unique Lines and Distinctive Shape of the P99 replica as a TRADEMARK of Walther. Modeled after the original Walther P99 and once used by the most famous "double agent" in the world, this 8-shot semi-automatic repeater offers both accuracy and durability. 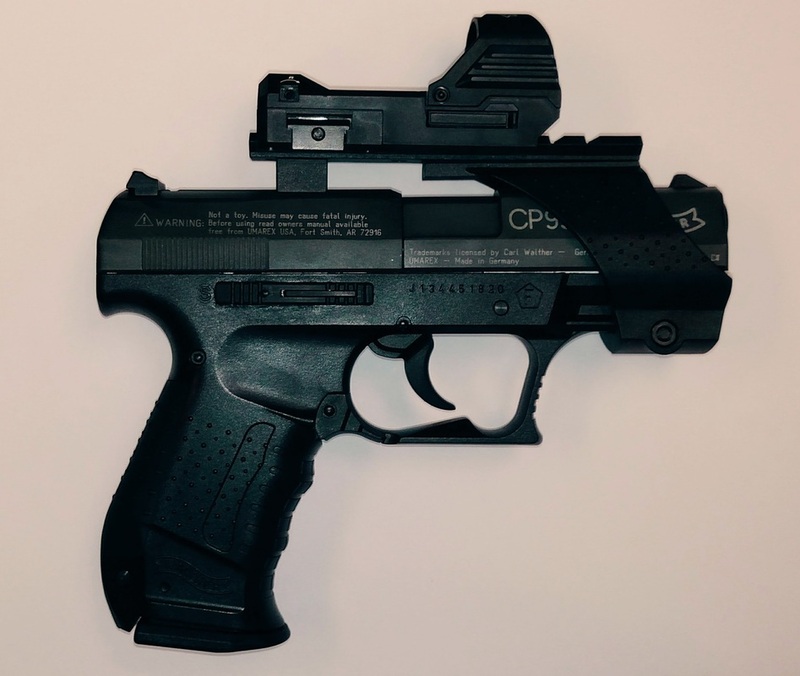 The Walther CP99 features a rifled barrel, decocking safety, drop out CO2 magazine, and comes with two 8-shot rotary magazines for quick airgun action. Comes in a foam-lined plastic gun case. Looking for a unique look and more accurate sights, We can add a raised weaver rail and install a dot sight for you. The Walther CP88 competition CO2 Air Pistol replica is ideally suited for "Action Shooting Target Games". The outstanding workmanship and the simplified modular system help make this an outstanding choice for both experienced and novice shooters. 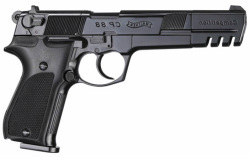 A replica in looks and weight, the CP88 is an economical choice for owners of similar firearms. An air pistol with quality craftsmanship like this Walther is perfect for muscle memory and sharp shooting. The Walther CP88 compact CO2 Air Pistol replica is ideally suited for Action Shooting, Target Games, and personal protection drills. Full metal design and single/double action this replica has the looks and weight. 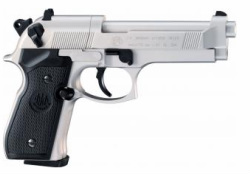 The CP88 is an economical choice for owners of similar firearms. An air pistol with quality craftsmanship like this Walther is perfect for muscle memory and sharp shooting. 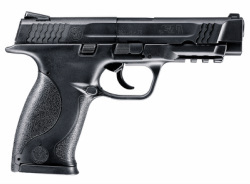 This replica is a great training pistol for S&W M&P firearm owners. A 10 shot repeater (Single or Double action) powered by 12 gram CO2 powerlets. add one of the sights below for the ultimate in improving your shooting accuracy. add the open reflex sight and forgrip for $50 and turn this beauty into an assault pistol! Superior accuracy and power. 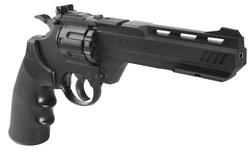 Manufactured in 8” 6" 2.5" revolver sizes, licensed by Dan Wesson, This Series is a new generation of Dan Wesson airguns with a rifled inner barrel allowing the use of pellets. This improves both range and precision. It has authentic markings and an individual serial number stamped into the frame. The revolver features a double action trigger system and adjustable rear sight for extra realism and accuracy. The Dan Wesson revolver is made of metal except for the ergonomic grip constructed in hard ABS plastic. The 12g CO2 cartridge is stored in the grip and is easily accessed by sliding the grip back – easy-load style. Each of the 6 cartridges holds one 4.5mm pellet and is placed in the metal cylinder that rotates as each round is fired. The revolver comes with speed-loader, attachable rail for optics and 6 heavy-duty all metal cartridges.